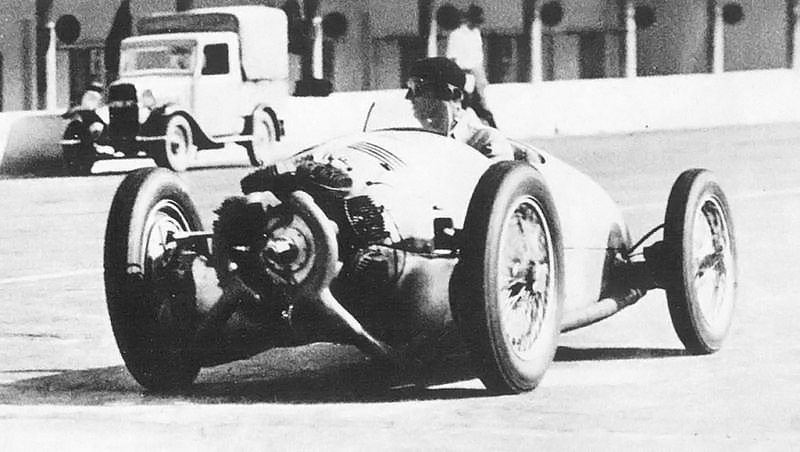 One of the oddest Grand Prix race cars ever built was the 1935 Monaco Trossi. 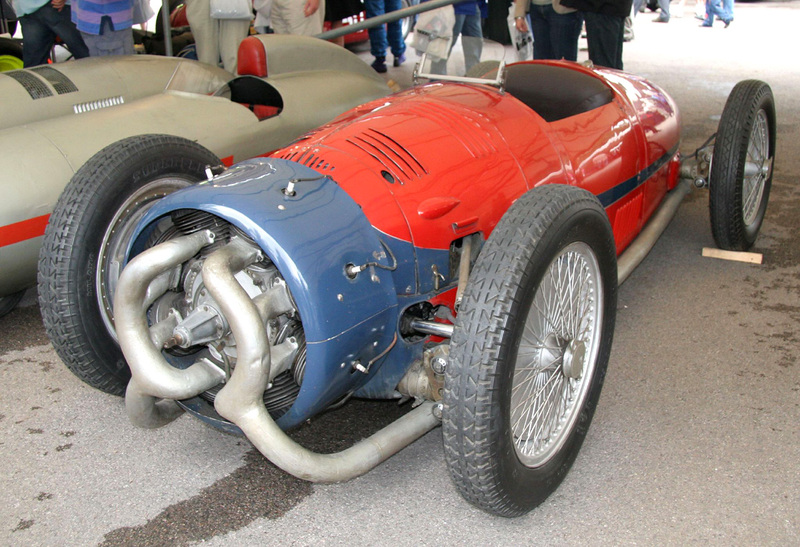 Built by Augusto Camillo Pietro Monaco and funded by race driver Count Carlo Felice Trossi, the 1935 Monaco Trossi was a front-wheel drive car powered by an air cooled, 16-cylinder, two-stroke radial engine. Augusto Monaco had built a successful racing car / hill climber but had aspirations of building a Grand Prix car for the 750 kg (1,653 lb) Grand Prix racing formula. For the Grand Prix car, Monaco joined forces with an engineer/driver named Giulio Aymini. The team also received support from Senator Agnelli at FIAT, who offered FIAT’s Lingotto facilities, in Turin, to build and test the new two-stroke radial engine. However, once the engine was built, tests revealed so many problems that Agnelli and FIAT withdrew their support, leaving Monaco in search of new financial and manufacturing assistance. A vintage shot of the Monaco Trossi at Monza. With the cowling removed to aid cooling, a good view is provided of the engine and its paired cylinders. Monaco convinced race driver Count Felice Trossi, who was a successful member of the Alfa Romeo team, to become a partner in the project providing financial and manufacturing support. The car was built in Trossi’s workshop, which was part of the Gaglianico castle outside Biella in northern Italy. A friend of Trossi, Count Revelli, helped design a streamlined body for the car. Many rumors and much speculation surrounded the racer, and it was finally revealed to the public at the Autodromo Nazional Monza in July 1935 for tests and qualifying sessions in preparation for the Italian Gran Prix. 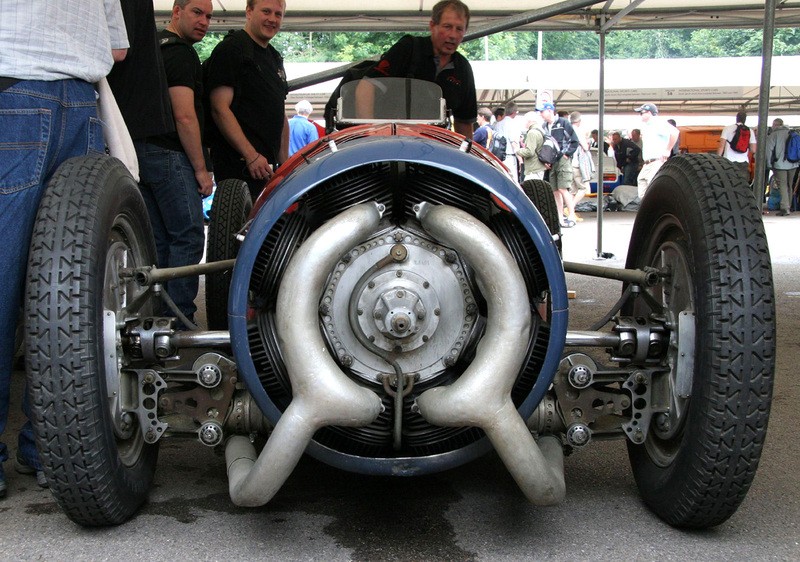 The air cooled, 16-cylinder, two-stroke radial engine was mounted at the very front of the car. With a 65 mm (2.56 in) bore and 75 mm (2.96 in) stroke, the engine displaced 3,982 cc (243 cu in). The cylinders were arranged in two rows of eight with each front row cylinder and rear row cylinder paired together. While having two cylinders and two pistons, each cylinder pair had a common combustion chamber and spark plug. The eight two-cylinder pairs were positioned around the crankcase. Being a two-stroke engine, there were no intake or exhaust valves. The inlet ports were in the rear cylinders and exhaust ports were in the front cylinders. The crankshaft was a three-piece design and the crankcase was made of duralumin. For both cylinder rows, the connecting rods were of the normal radial engine type with one master rod connected to the crankshaft and the seven articulating rods connected to the master rod. Rare view of the Monaco Trossi under its own power at Monza in 1935. Behind the engine were two Zoller M 160 superchargers providing a pressure of 0.68 atm (10 psi), each supplied by a Zenith carburetor. Exhaust gases discharged into two four-pipe manifolds on the front of the engine. These manifolds led to two long exhaust pipes that extended under the car and exited behind the rear wheels. The engine produced 250 hp (186 kW) at 6,000 rpm. Power from the engine was transferred to the four-speed transmission by a shaft that went through the transmission to the clutch, then back into the transmission. The independent suspension for each wheel was provided by double wishbones, horizontal coil springs, and cockpit adjustable oil dampers. The aircraft-type spaceframe chassis was made with 4 cm (1.57 in) diameter manganese-molybdenum steel tubes with larger cross tubes at the front and rear. The lightweight alloy body panels were screw-fastened to the chassis. The car featured large hydraulic drum brakes on each wheel, which was advanced for the time. Front tires were 5.25 x 31 and rear tires were 4.40 x 27. The vehicle weighed about 710 kg (1,565 lb). 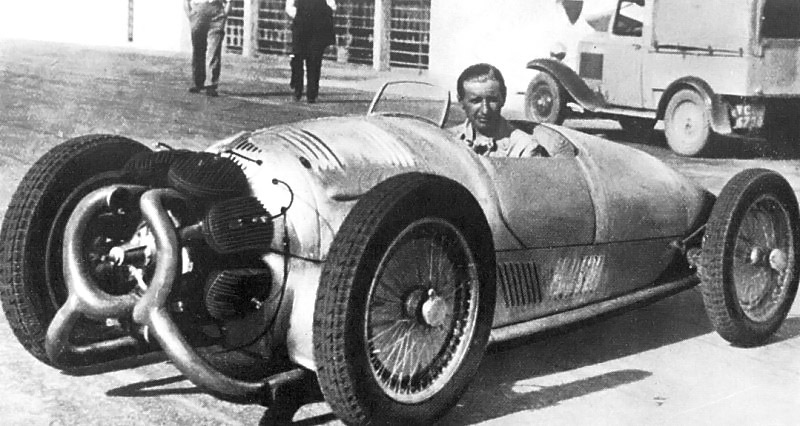 Both Aymini and Trossi tested the car at Monza reaching speeds of 240 km/h (150 mph), and the car was on the entry list for the 1935 Italian Grand Prix. However, testing revealed that the car experienced severe overheating and a tendency for the engine to destroy the spark plugs. But the more serious issue was the extreme understeer caused by the 75% front / 25% rear weight distribution. With the problems uncorrectable without a serious redesign, the car proved too dangerous and it was never raced. After Count Trossi’s death in 1949, the 1935 Monaco Trossi racer was donated by his widow, the Contessa Lisetta, to the Museo dell’Automobile in Turin where it is currently on display. This entry was posted in Automotive on 1 September 2012 by William Pearce. The overheating problem was no doubt exaserbated by those front exhaust manifolds blocking air from the cylinders. Regardless- 250 hp in 1500 lbs are pretty radical numbers for 1935.